So let's see. What if the same situation had been handled within different rules to this game, from a perspective of people's priority over capital? What if the factory had been a cooperative where all the workers are part owners. The bicycle factory produced the capital it accumulated to be able to afford the new technology together, not only the capitalist owner, therefore when the decision is made to invest in the new technology, all of the worker-owners will have to benefit by maintaining their jobs and earning more. But only half the workers are needed to do the jobs. No problem, they reduce the working hours for each worker to keep every one employed and use the spare time to learn how to increase even more the efficiency of their factory. The consumption is maintained by every one because not only they kept their job, but they got an increase in earnings since now they produce twice as many bicycles. The result is we move into an economy of full employment, with cheaper products, half the working hours, where more and more robots are making all we need to consume to the point eventually everything will be made by robots and every one works a few hours a week to increase productivity and maintain the robots working, translating into a wealthy living but not ridiculously rich. It sounds simplistic but actually it is already happening with many businesses going cooperative, and the numbers showing the wealth is being generated are there, it is just not properly shared. Think of businesses like a newspaper that used to charge you $60 dollars for a classifieds ad of three ridiculous lines two inches wide for two weeks. They had to pay a telephonist to take our calls, write down the ad and collect our money. Then it had to go into production, be printed on wasteful paper and then distribute it every day for two weeks with all the printing costs, rent costs, the distribution costs of trucks, drivers, fuel etc. So we know how the wealth is being generated and see it is done thanks to technology from a new paradigm forcing the old one to move onto the wastebasket of history (as represented by Ms Coppola's capitalist mentality). The reward for the new efficiencies achieved are not being shared in the capitalist system set up, as statistics show salaries of most labor have remained stagnant, and this is so because the main engine capitalism has relied on, namely self-centered determination and greed, has come to the end of its useful life. We can not any more, behave like selfish irresponsible adolescents while holding the power of nuclear bombs, using wars as a means to spark up the economy, and destroying the biosphere that gives life to this earth. A rich man like Carlos Slim or Bill Gates think of themselves as the legitimate owners of all the capital their companies generate, without ever thinking their "success" couldn't be attained without the consumers they satisfy with their products and services. I am very aware of the heresy I am suggesting when I give equal importance in value to both the producer and the consumer, but the fact is "success" can only emanate from this relationship, and wealth wouldn't be accumulated without the process by which products are being consumed. The best invention would be useless unless it was consumed by masses of people willing to pay for it. So from this vantage point, success could not be achieved by one without the other, therefore, who should really be the owner of capital? My answer is both, but most of it should be society at large. The community where the economy functions and generates this wealth, is together generating the capital being accumulated through the symbiotic process of producer-consumer together with the physical, educational and efficient social management infrastructure. Warren Buffet a "self-made man" said something to the effect he couldn't have achieved his wealth unless he had the advantage of doing it within the confines of an economy with the infrastructure and sophistication of a society like the US. I agree community members with ideas and leadership qualities should live very well and keep some of the wealth they are helping create, but today's infinite, open-ended accumulation of wealth has proven to be counter to society's benefit, as we can see in today's fake crisis. There is a twisted logic that because someone has the ability to accumulate more capital, somehow that makes them more capable to decide for the rest of society in all other issues. Of course not. In Capitalism that wealth not only gets them to have a higher purchasing power, but also political power, which results in today's political corruption from the White House down to Congress and the Supreme Court shows how self destructive it is. Here is where it gets tricky when we start tampering with one of the sacred tenets of capitalism, as to who owns the capital, hence the name "capitalism". But as we have seen in Ms Coppola's article, this very feature is what is stopping the economy from making the leap to a full employment economy and a proper distribution of wealth to sustain consumption while embracing robotizing the economy. There is no doubt the freedom for any one with a good idea to enter the market offering a better service or product to satisfy peoples' needs is one of the best features of a market economy, but what we're trying to do now is to achieve it going beyond the capitalist model while at the same time offering the entrepreneurs an even better capital support to put their ideas into motion, creating more efficiency, more wealth and more jobs where needed. In the capitalist model it is the owners of capital, be it the entrepreneur herself or an investor or banker who will put the capital to start the venture and they all expect a return on their capital investment. In the new model we want to enhance the opportunities by making capital available more readily to a wider range of people, by offering capital for free. But the question is, what really motivates people to be creative, to be an entrepreneur? There is a misconception regarding what motivates entrepreneurs to seek their dreams by putting their plans in motion. While the attainment of wealth is an obvious goal to live comfortably, getting rich is not necessarily the motive. 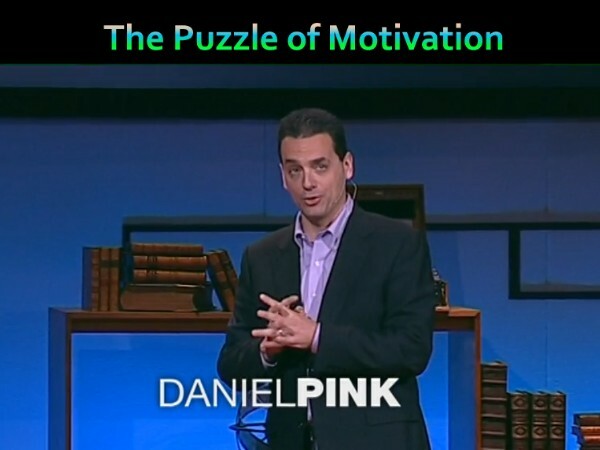 Many other factors are part of the motivation as shown HERE by Dan Pink. So if we as a community realize that by pooling our resources together and in recognition of the vital service entrepreneurs bring to society by being go-getters, visionary and creators of jobs, we offer them the funds to realize their dreams with the condition the community remains a silent partner in the business, giving them wide ranging authority to grow the company, with the rewards to live comfortably shared by the community as much as assuming the risks of failure, I believe a more stable economy will ensue without the capitalist's boom and bust cycles we see as normal today. This suggestion is merely a glimpse on the workings of what is required to truly establish a new socio-economic system where the notion of making money with money is not possible, where personal capital is limited and can't be invested directly on any enterprise, the stock market doesn't exist, where for-profit bankers don't decide who gets funding, and much less where the private banks do not create the money supply in a fraudulent ponzi scheme called Fractional Reserve Banking as they do today, where there is not a central bank controlled by for-profit scumbags. Instead in the new paradigm profit itself has been socialized and it is the community that requires businesses are administered with the purpose to give service to its members in a long term bases, not merely short-time gains, as in making education totally free, because statistics show, the more of an even playing field, the more numbers of people can offer their best to the benefit of all. 2- That hidden capital is kept out of circulation and it is not being recycled into the community as the needed investment funds to service its needs which is worse than not paying taxes, but never mentioned in the corporate Media. So if there is anything clear today, capitalism is touching its glass ceiling unable to resolve the contradictions its capital sense of individual property is limiting the possibilities of full employment and consumption exposed in the Coppola's article. With the advances of technology. Robots will eventually do everything we humans do as a job and if we don't leave that capitalist relationship between the owner of capital and the seller of labor behind, and enter a new paradigm where they share ownership of the wealth generated, it will choke on its own lack of currency flowing into the Real Economy as it's happening today. 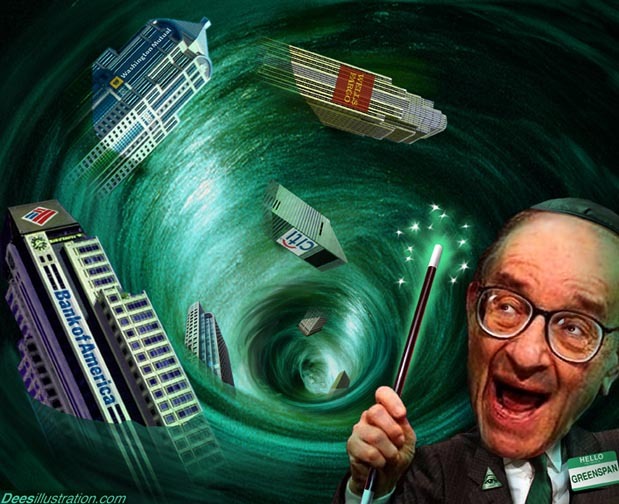 The charade of Q1, Q2 and the eternal Q3 the FED is caught up in, is merely attempting to unwind the financial sector excesses but unable to stop it's downward spiral, plus it is not feeding properly the productive sector or Real Economy, otherwise there would be full employment and consumption today. ​​​​Another important aspect bringing in capitalism's inevitable end, is its relentless pursuit of growth in a finite world. Today's world resources, from fisheries to oil, to lumber and metals and arable land is being depleted. 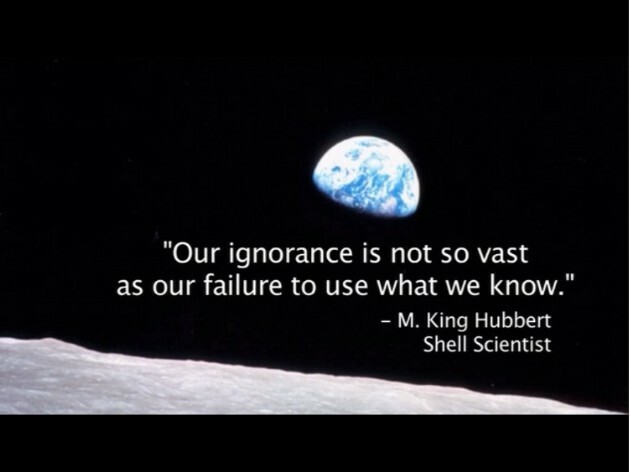 Scientist have come to the conclusion that for the 7 billion humans to have a middle class existence, we would require the resources of 5 planets the size of the earth, which makes a mockery of the suggestion the wealthy countries offer the poorer countries, namely "If you work hard and intelligently as we do, you can attain what we have" Nonsense. They won't, in this system. - Profits are personal, not the product of social interaction. - Greed is good, as Milton Friedman stated unabashedly. - The 40 hour labor week as if written in stone. - The motivation to work and create is merely for money. - The production of the money supply by for-profit banks. - The confrontational approach between capitalists and laborers. - An illegitimate government refusing to deliver what has promised. 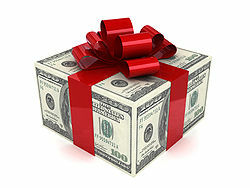 - Guaranteed income for every one. - Prohibition of Legal Tender currency laws. The time has come to think outside the box. ​​Ms Frances Coppola's article called The wastefulness of automation is an amusing spectacle apt for a circus contortionist. She bends twists and turns mentally trying to find an impossible solution within her frame of reference. She's confronted with the question of "hysteresis" (the decline in the quality of human capital when skills are not maintained - due to unemployment or under-employment) as the result of robotics supplanting humans in the work place. She tries and tries to resolve it within the capitalist ideology box she has grown to live in, to no avail, and exhausted (it is too long) at the end of her article, she throws her arms up into the air saying, rather conflicted "....may be Chris is right (about the government offering 'Basic Income') capitalists DO need a large labor force", she's saying it as if that Basic Income feature could solve the problem by itself, when in fact capitalists want not only a large pool of workers to have purchasing power to buy their products, but they want them starving as well in order to pay the lowest wages, therefore basic income would take away the pressure from workers to fight in long line ups for the scarce jobs available. That she's further impaired by the fact she's held inside a straight jacket of a banksters' mentality, it is no wonder she is at a loss to understand the new world we're coming to, unable to figure out a way to implement the wonders of technology into a dying capitalism paradigm because of a lack in consumption, among other things. To illustrate her conundrum we'll compare it with the enigma encountered by someone used to communicating long distance with homing pigeons trying to compete against the mobile telephone technology. Don't matter how well he trains his pigeons and how well he feeds them to fly faster under any weather conditions, he can't fathom the underlying mind-set required to jump into the next paradigm of communication. Similarly Ms Coppola's shortcomings are in her fixation to a socio-economic system that as a base gives priority to capital, over people. In her mind she can't imagine to give priority to people as workers and consumers in opposition to capital. Capitalism has transformed people into merely another commodity to be priced and eliminated when is convenient. And it is this precise dichotomy which Ms Coppola is struggling unsuccessfully to deal with in her piece, hence her ridiculous title, arguments and conclusions. While it's true Capitalism has brought us to new heights in technology and economic development, showing us so much what it can do as a deliverer in the application of new inventions that were not easily developed by all other past socio-economic systems, including so-called Communism, with its efficiency in capital investing on people intelligent enough to develop them, today this system is coming to the end of its useful life, as shown by Ms Coppola's unsolved dilemma. One of the seeds of its own destruction happens to be precisely in the capitalism feature of separating capitalists from those who merely offer their labor, giving capitalists the priority over who owns the profits emanating from the enterprise they both generate the profits from. THIS IS THE KEY to understanding Coppola's and the other capitalist minded misconceptions, and why she could not find a solution to robotizing the economy. 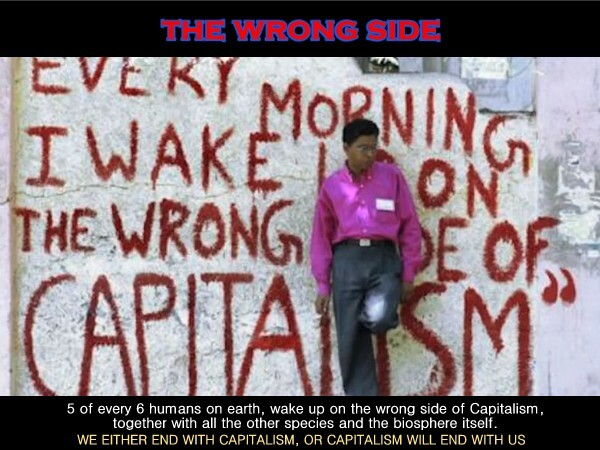 Capitalism is at a loss in resolving this contradiction because its emphasis on capital over the well being of people has been wrong all along. The economy is not only about the efficient production of products, but also as important is the consumption of those products, and that won't happen in capitalism if the consumers have no purchasing power without jobs due to their displacement by machines. How is the pie divided when profits and real wealth are generated is an important key to solving this situation. -We have a bicycle factory with 100 workers and produces 1000 bicycles per month. Over a couple of years capital is being accumulated, expanding the customer base and management decides to design some robots to automatize parts of the production line. The capital saved and some borrowed from a local bank, is spent on making those robots and the result is the same factory can produce 2000 bicycles per month with half the work force. This allows the cost per bicycle to be reduced while profits soar and accumulate more capital even faster. The typical capitalist response today is to let go half the work force and for management, the owners of the factory to keep all the rewards of this increase in efficiency, while the laborers and technicians may get a paltry increase in salary, or as witnessed by the last 30 years statistics showing, actually no real growth in salaries for the masses of workers while the economic efficiency has increased dramatically thanks to technology (hence Coppola's dilemma with robotics), and wealth has grown despicably high for the 0.01% as shown clearly in the following video.